This is absolutely my favorite picture! 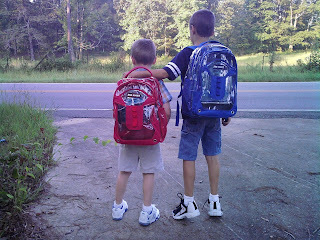 Benjamin is assisting his brother on the first day of school. He made sure he followed all the rules on the bus and found his way to his classroom. What are big brothers for????? So cute! 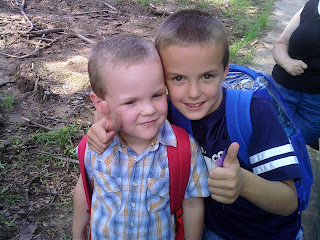 Glad to hear that their first few days went well! I was afraid Cohen would end up just wandering off if he didn't like it, but he took it like a man and has been going studiously every day!!! He's even charmed all the female teachers into thinking he is God's gift to teachers!!! !